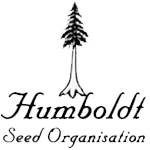 Humboldt Seed Organisation - Lemon Garlic OG. Free US delivery. Lemon Garlic OG was bred by the newest member of the Humboldt Seed Org. viz. California Kind Genetics. Hidden away deep in the mountain ranges of Humboldt County California for in excess of 15 years it has produced one of the most singular OG phenos anywhere. It is 80% indica and 20% sativa. 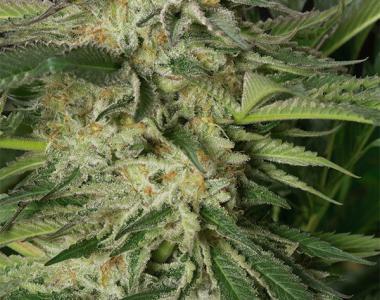 Growth during the vegetative phase is almost shockingly fast, so much so that this phase can be kept very short before transitioning into the flowering period by reducing the hours of light to 12/12. The structure is quite open and this fact, coupled with its long, slender leaves, means that light penetration to the interior budding sites is very good. Nutrient requirements are not high so care should be taken not to over-feed. The flowering stage takes between 63 - 68 days and this is long enough for the buds on the spaced inter-nodes to pile on weight and run together forming long colas. Indoor growers can expect yields of between 375 - 525 gr/m2. Outdoors plants grown in the ground can reach a height of 3 - 5 meters with outstanding yields of up to 3 kilos. Harvest in northern latitudes will be during October. THC levels are high between 17 - 22% with low CBD at just 0.1%. Pungent aromas during flowering and the production of copious amounts of resin are hallmarks of Lemon Garlic OG. The flavours of garlic, citrus and pine combine to create a mouth-watering melange. Its effect is very cerebral as well as physical and it is a great appetite stimulant. The high is very durable and long-lasting.